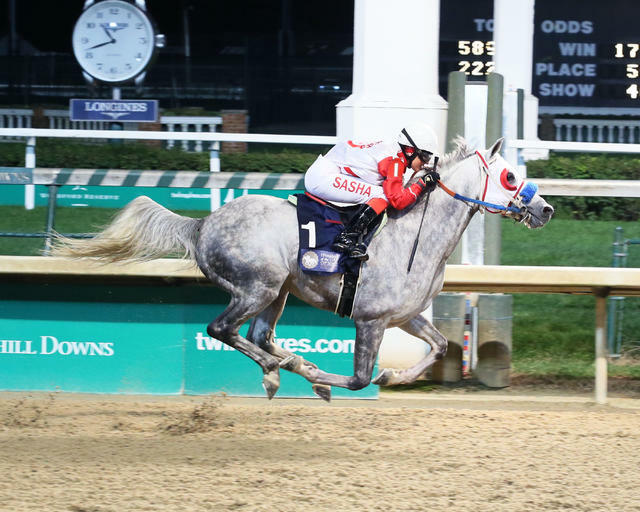 Betty and Joseph Gillis’ Mississippi-bred Quick Sand AA scored a romping nine-length score in Saturday’s $100,000 President of the United Arab Emirates Cup (Grade I) for purebred Arabian 4-year-olds and up at Churchill Downs. Quick Sand AA rallied from off the pace under jockey Sasha Risenhoover and passed pace-setting Uptown Sandy Girl at the top of the stretch to score a comfortable victory. Madjikman, under jockey Shaun Bridgmohan, rallied to finish second while Quick Sand AA’s stablemate Easter Man picked up third with Keibar Coa aboard. Trained by Jerenesto Torres, Quick Sand AA has now won 11-career races through 22 starts with earnings of $262,711. The 5-year-old gray son of Burning Sand paid $5.60, $3.80 and $2.60. The victory was Quick Sand AA’s fourth Grade I win of 2018 and makes him a likely Arabian Horse of the Year winner. The homebred previously won the Aug. 18 Delaware Classic Handicap (GI) at Delaware Park, the April 7 Fatima Bint Mubarak Stakes at Santa Anita Park and the Sheikh Zayed bin Sultan al Nahyah Stakes at Sam Houston. This was the sixth time since 2011 a race for purebred Arabian horses – the world’s most ancient breed of equines – was staged at the world-famous Churchill Downs.